First this week Superman hit the $1m jackpot for a comic book sale (CLICK). Now Batman has topped that mark. 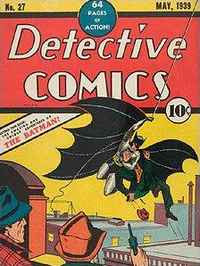 At an auction in Dallas, Texas, US auction house Heritage sold a rare 1939 copy of Detective Comic No 27 - the first showing of Batman - for over $1m (£655,000). The seller bought this comic in the 1960's for $100 (£65). I'll have to have a rummage through my pile of old comics: Kid Colt Outlaw, Matt Slade Gunfighter, Justice Traps The Guilty, Blackhawks and Mad Magazine (first three issues mint).